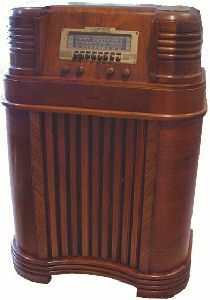 The Philco 40-180 is a highly successful and generic console that sold in numbers exceeding 125,000 for a price of $69.95. The cabinet design was obviously favored among consumers compared to other lower-cost models that year. 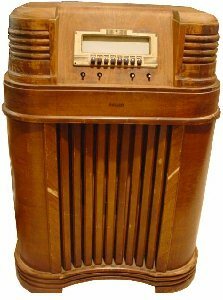 My Philco 40-180 was purchased at a VRPS auction in need of attention as shown below. The radio needed cabinet refinishing and straight-forward electrical repairs. The dial was reproduced by printing out the dial scan provided by another 40-180 owner as shown below on paper and sandwiching it between two plates of thin glass.